Spring is coming—hard to believe this year, but true—and summer will follow close behind. If you’re like me, the inclination to cook elaborate dishes evaporates with the appearance of warm, sunny weather. Salads are what appeals to me, and even better wrapped up to be easily enjoyed outdoors. Here is a fresh and seasonal recipe excerpted from 300 Best Taco Recipes by Kelley Cleary Coffeen © 2011 Robert Rose Inc. www.robertrose.ca Reprinted with permission. All rights reserved. This salad-style taco is fresh and inviting. Enjoy amazing textures accented with tangy lemon and a creamy sauce spiked with chile. Rinse and pat dry all vegetables with paper towel before chopping to prevent a soggy texture. 1. 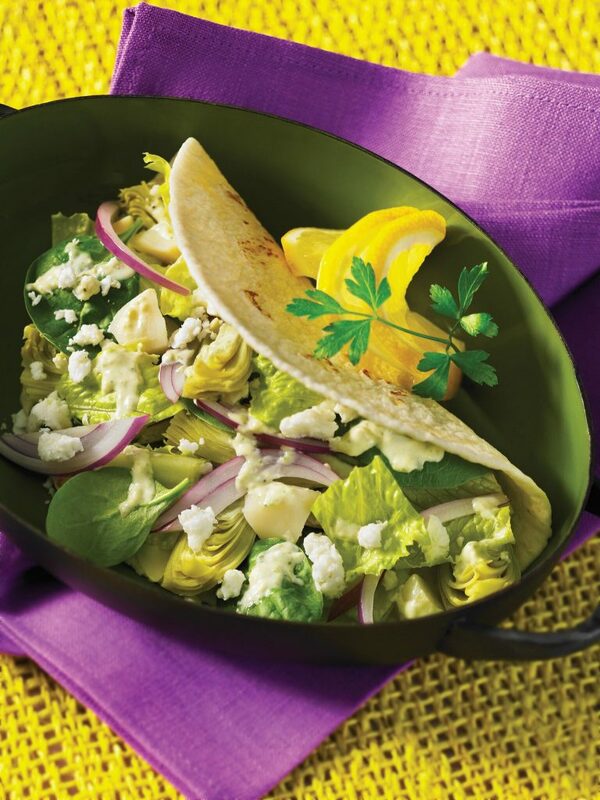 In a bowl, combine spinach, lettuce, artichoke hearts, red onion and water chestnuts. Cover and refrigerate for 30 minutes or for up to 2 hours to allow flavours to blend. 2. Just before serving, toss spinach mixture with lemon juice and Jalapeño Cream Sauce. 3. To build tacos, divide spinach mixture equally among taco shells. Top with cheese. Fold tortillas in half. In a blender or food processor, pulse mayonnaise, yogurt, jalapeños and cilantro until smooth. Season with salt and pepper to taste. Transfer to an airtight container or squeeze bottle. Refrigerate, stirring occasionally, for 1 hour or up to 4 days.